Mint : There is no mint mark, which is assumed to mean coins minted at London. While the exergue is off the flan, the positioning of the other letters and extrapolating he outer ring, demonstrate that no mint mark would have fit in that position on this coin. Size : 19.2 x 20.8 mm. Weight : 3.35 grams. Grade : VF with a mid-brown patination. Some weak areas and slightly off-centre. Obverse : Radiate head of Carausius right, with IMP CARAVSIVS P F AVG around. 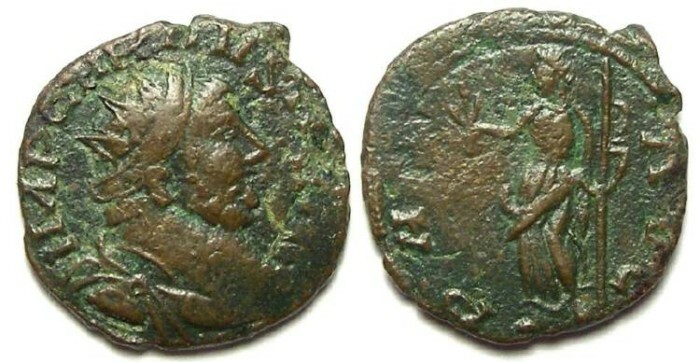 Reverse : Pax standing left holding a branch and sceptre, with PAX AVG around.